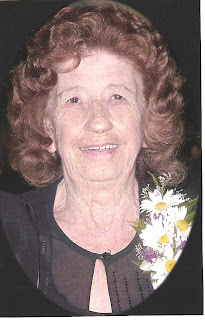 Tomorrow we will say our final good-bye to my mom. She was such a lovely lady and beautiful person. Sleep doesn't come tonight - so many thoughts swirling though my head. I miss her so much. She fought a hard battle with Alzheimers and in the end, cradled by those she loved and who loved her, she peacefully slipped away. To a better place I know. My head and my heart are in such conflict. Reach out to all that are still here and love them, hold them, touch them......while you can! Rest in peace, mom. You will always be in my heart. I remember the events of 9-11-2001 and it still brings chills just thinking about it. Today we visited The Healing Fields and it is an amazing tribute to those brave men, women and children who lost their lives on that horrific day. 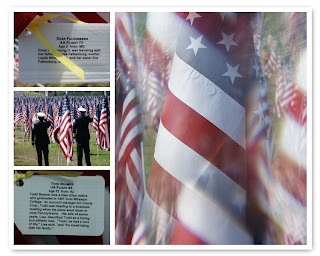 There were 3,200 flags displayed with a brief bio of all but 200 (those have not been identified as of this date). It was impossible, both physically and emotionally, to read all of the bios. A beautiful ceremony was given in their honor and I left with a sadness in my heart for them, their families and loves ones, and for our country. Also, a renewed faith that our country will continue to be strong! I'm linking with Mary at Little Red House for Mosaic Monday. It's been a while since I've been able to join her. This is our two-week old new grandbaby - Breann Nicole. And she was born on her Grandpa's birthday - yes, we are very excited to welcome her. Such a perfect little bundle of joy! And that hair - isn't it amazing! Goodness, what a brisk fall day. It was difficult to drag myself out from under the covers this morning. Windows were open last night so that we could listen to the "critters" and the soft breezes.....well, even the "critters" were too chilly to chirp this morning! This Labor Day is the first, ever, that we haven't had a get-together or a project to at least begin. Hubby purchased a new I-Pod for him and a Nook for my for my upcoming birthday....so as you might guess, the day was spent putzing and playing with the new toys. The search is on for a handy dandy cover for the Nook Color. Does anyone have any recommendations? He is the computer savy one in this family - and thankfully he enjoys figuring these gadgets out! What did you do on this Labor Day? Hope everyone enjoyed!!! This is the face of an Unhappy Camper!! Thought it was a tad stuffy at zero-dark-hundred. Jumped up and went in the living room to cool off. Leather furniture always feels cool when one is blessed with those lovely "Power Surges" from hell, as that condition is not-so-lovingly referred to in this household! Things just weren't cooling down as they should....guess what? On this lovely Michigan day, when the weather is nearing recording-breaking temps again....the air conditioner apparently decided to revolt! Must be male because nobody else could possibly find the humor in that! So the motto for today is "When life gives you lemons - make Vodka Lemonade!" I'll just wait impatiently for the repairman with a tall glass of peach tea - that is more my speed. Hope everyone has a wonderful AND COOL day!! !